There are both standard and a waterproof conductivity meter, as well as a conductivity meter available for flowing water or pure water (highly recommended for specific industries) as well as the ones with different conductivity measurement ranges. An important factor is that a conductivity meter normally measures electric conductivity in µS/cm, however it can also take measurements in mg/l (for direct reading of content in dissolved solid substances). The relation is established as follows: 2 µS/cm = 1ppm (parts per million) = 1 mg/l. Compensated temperature in the conductivity meter can be automatic or by hand. The conductivity meter PCE-PWT 10 is a good solution for anyone who wants to check the conductivity of ultrapure water and to accurately determine the salinity of liquids. With our conductivity meter PCE-CM 41 it is possible to measure conductivity value, the amount of all the solid material or dissolved salts (TDS - Total Dissolved Solids) and the temperature. Our conductivity meter PCE-CM 41 is very easy to carry everywhere thanks to its small size. Auto ranges up to 20,000 PPM. With the conductivity meter PCE-SM 11 conductivity in non-saturated solutions can be quickly and accurately determined. The Conductivity Meter PCE-SM 11 has a high measuring accuracy thanks to the automatic temperature compensation. The conductivity meter PCE-PH 25 offers the user comprehensive measuring applications. In addition to determining the pH value, the PCE-PH 25 conductivity meter also shows the conductivity, the filtrate dry residue, the salinity and the temperature of the sample. The conductivity meter PCE-PH 25 is a measuring instrument for mobile use. The PCE-PHD 1 Multifunction Conductivity Meter is a portable and effective measuring device with multiple capabilities for inspecting water quality. Offering extraordinary precision at an affordable price, the Multifunction Conductivity Meter is used for laboratory and in situ testing of the pH value, redox, conductivity, salt content, oxygen level and temperature of water. The Multifunction Conductivity Meter PCE-PHD-1-KIT1 is a true all-rounder for checking water quality. The portable multifunction conductivity meter is used to control the water parameters pH, redox, conductivity, salinity, oxygen and is also very suitable for temperature measurement. Storage, electrolyte, conductance and calibration solutions are included in this comprehensive kit. PCE-COM 20 is a portable handheld non-destructive conductivity tester for non-ferrous metals. This non-destructive testing (NDT) device uses eddy current to determine the electrical conductivity of non-ferrous metals such as aluminum and copper. Includes 3 standards for testing. The electrical conductivity, measured by a digital conductivity meter, of metallic materials describes how easily an electric current can flow through the material. A material with high conductivity is copper. Therefore, copper is also used in power lines. Copper also has an advantage that it does not change much in its properties. So, it is approximately like silver, which is the best electrical conductor, but also has got a disadvantage due to the softness of the material itself and in addition it is very expensive. For thin wires silver is also not suitable. Only for very special applications silver is used as a thin coating. An important application field for a digital conductivity meter is the qualification of material. A conductivity meter is used to classify the type of the metal. Also in the study of aluminum products prior to anodizing the measurement of the conductivity by a digital conductivity meter plays an important role. The application of electrically conductive coatings is becoming more and more important. Also here the measurement of conductivity helps to classify both the base material as well as also the coating material. Because the electrical conductivity decreases with increasing temperature of the material, the measurements must therefore always take place under the same temperature conditions, and the conductivity tester should have a function of an automatic temperature compensation. The conductivity of a liquid substance is defined as the ability to transmit heat, electricity or sound. The unit of electrical conductivity in SI units Siemens per meter [S/m]. Pure water is not a good electrical conductor. If ordinary distilled water is measured with a pure water tester, the conductivity is between 0.5 ... 5 μS/cm. Because the electric current is transported by dissolved ions, the conductivity increases with increasing ion concentration. 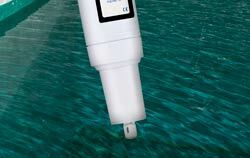 The conductivity is ideal for characterizing water in a wide variety of applications. In pure water applications, such as in the pharmaceutical or semiconductor industries, conductivity is even the most important parameter for testing the purity of water. In addition, conductivity tester are used to test the purity of nonaqueous samples such as fuels, since small traces of impurities often result in a very high increase of conductivity. The use of pure water tester is a standard in the analytical laboratory. 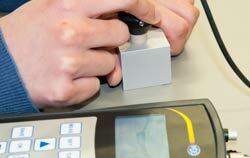 However, the complexity of this allegedly simple measurement method is underestimated. Electrolytic conductivities are very temperature dependent. For simple electrolyte compositions, the dependencies are well known. Thus, the conductivity of a potassium chloride solution deviates by about two percent per degree Celsius temperature change. In order to achieve comparable results, the temperature must always be determined during the measurement with the digital pure water tester and the measured value for the conductivity must be converted to a reference temperature. For this purpose, the temperature dependency of the sample solution must be known or determined by own measurements with the digital conductivity meter. The best results are obtained when the measuring solution is kept constant at the reference temperature. The reference temperature in the range of conductivity measurements has been 25 ° C in most applications.